11.00 Arrive Nagarkot, light lunch (noodle soup and fruits) will be served on a local restaurant. 12.30 Start riding down to Mahadev Besi and continue up to Palanchok Bhagabati. We'll visit the famous temple and enjoy the scenery there and drive back to the highway and continue to Dhulikhel. 09:00 Start riding to Dapcha enjoying great scenery of the Himalayan range passing through the beautiful villages to Pauwa. 11:00 We ride back the same route up to Namobuddha and visit the beautiful monastery there then will follow the another route to Panauti and take a back road to Lakuri Bhanjyang, lunch will be on the way. 13:30 Arrive Lakuri Bhanjyang and ride up for approx 1 Kilometer for the great view of Kathmandu valley and the Himalayan giant to the North. Cost includes: One night accommodation in Dhulikhel Lodge Resort, Meals and bottled drinking water, Engine oil and fuel (petrol) as required for the tours, bike rental cost, One guide and a mechanic and their allowance. Cost does not include: Medical treatments, Emergency and Evacuation costs, Travel medical / insurance and personal nature expenses such as tips for the mechanic, alcoholic beverages. 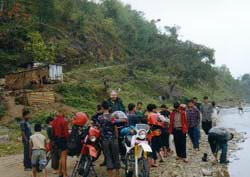 11.30 Arrive Devighat, light lunch (noodle soup and fruits) will be served on a local tea-shop. 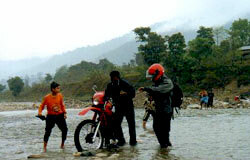 12.00 River crossing and follow 20 KM off-road to Galchhi where the Mahendra highway meets and continue ride to Chitwan, Sauraha. We will have some snacks on the way. Cost includes: One night tourist standard hotel accommodation in Chitawan, Meals and bottled drinking water, Engine oil and fuel (petrol) as required for the tours, bike rental cost, One guide and a mechanic and their allowance.